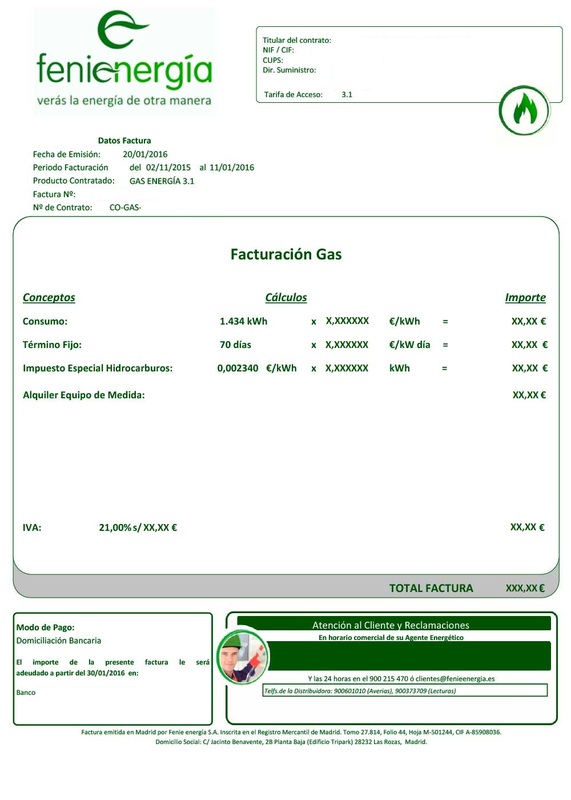 Date, invoicing period and the name of the tariffs contracted with Fenie Energía appear, along with the invoice number. 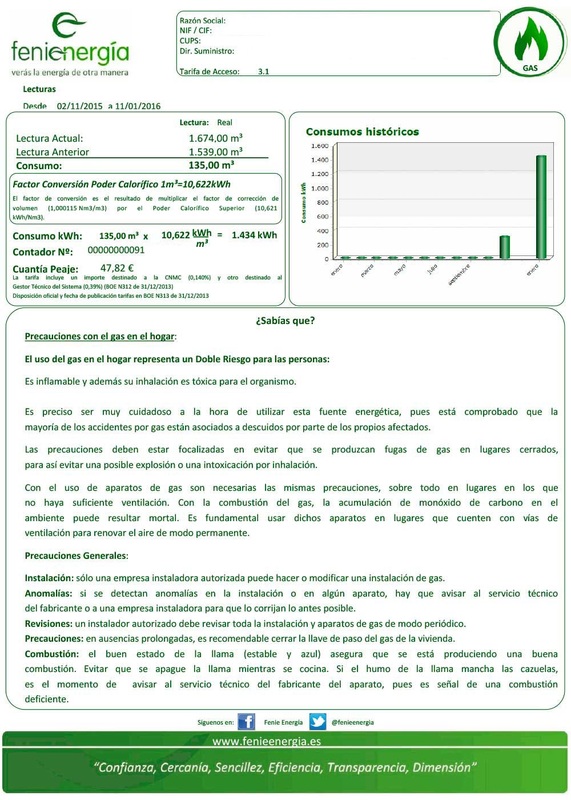 * Want to know more about the different gas tariffs we have at Fenie Energía? a) Consumption: This is stated in kWh, with the consumption being calculated by multiplying the gas consumption in “m3” by the “Heating Power Conversion Factor”; to give the price of consumption, the above result must be multiplied by the contracted tariff. b) Fixed term: This value does not vary depending on consumption, but is calculated by multiplying the contracted fixed term by the number of days invoiced. d) Metering equipment lease: this is the price set by the distributor for the leasing of the meter. e) VAT: 21%, applied to all values on the invoice. This specify the approximate date when payment will be collected, and the account number to be debited. All relevant numbers of interest are shown. a) Contact details of your Energy Agent, who will handle and resolve your queries. b) Contact details for Fenie Energía and the customers. Likewise specified is the amount of the invoice allocated to tolls, with a brief explanation. Consumption history in monthly or bimonthly form, allowing you to analyse your gas consumption over the past year. In this section we provide useful information for customers, such as alerts or details of interest.